Team Food developed a new product for Latin America after suffering a 50% drop in vegetable oil sales in this highly competitive market. To ensure positive customer response to the launch, the animatic and final commercial were continuously measured. By combining eye tracking and neurophysiologic technology, the client was able to strengthen its position, improve its brand awareness and recover its sales figures. YanHaas, a Colombia-based market research company, performs advanced studies for clients in South America using eye tracking technology as a key component. 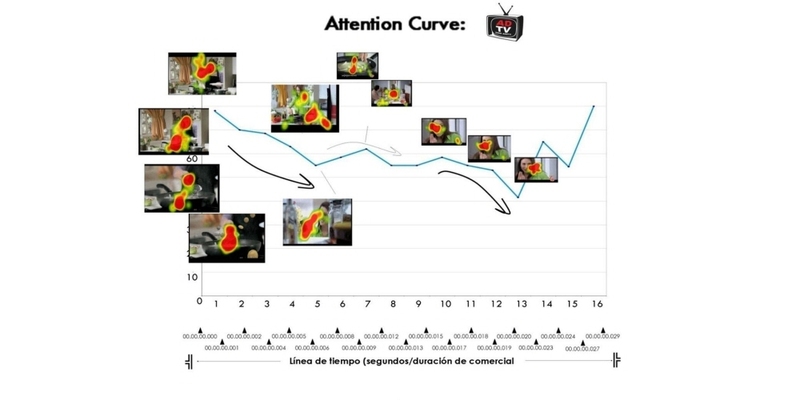 By introducing eye tracking into the standard TV commercial development procedure, opportunities and flaws can be identified on a scene by scene level. In this study, YanHaas worked together with multinational brand owner Team Foods in their pursuit to regain market shares after losing 50% in sales over the past few years. The main objective was to evaluate the animatic before production of the final commercial to ensure positive reactions with the aim of reversing Aceite Z's negative sales spiral and achieving a 5% increase in Top Of Mind awareness. Moreover, the study set out to ascertain the usefulness of measuring an animatic. By comparing results from the animatic with that of the final commercial, YanHaas could evaluate attention similarities in elements and determine applicability, thus validating the test itself. Eye tracking is more than just another research tool; it has enabled us to gather more insights about commercial content than any other traditional methodology. The commercial success of our clients is always our main goal, and eye tracking is an important component in this pursuit, very much so in this particular project. The study used eye tracking as a component to complement other research methodologies, such as focus groups and one-on-one ZMET interviews. Team Foods and YanHaas chose eye tracking for its efficiency and its ability to pinpoint concrete elements for improvement. After initial focus group studies, an animatic was created and tested using eye tracking on the target group; Women ages 25-55, defined and selected by Socio-Economics and Lifestyle (SEL) segmentation. Eye tracking data was collected using a Tobii T60 Eye Tracker. Afterwards, the respondents were asked to participate in a purely qualitative component of the study that used Zaltman Metaphor Elicitation Technique (ZMET) to assess emotional linkage via cognitive imagery. The combined methods successfully measured the five dimensions set up by Yan-Haas for this project. Eye tracking data was analysed and presented using Tobii Pro Studio software. YanHaas concluded that eye tracking was a great measurer of the attention, branding and message dimensions. By being able to study frames in detail, YanHaas could link rise and fall in attention and concentration levels to dramatic curves, logo display and key scenes. The study tested response to different camera angles and found medium shots and close ups more effective than wide shots. Low angles also showed increased levels of attention contra high angles. The final commercial was adapted after these findings. In general, this commercial scored higher than average attention levels. 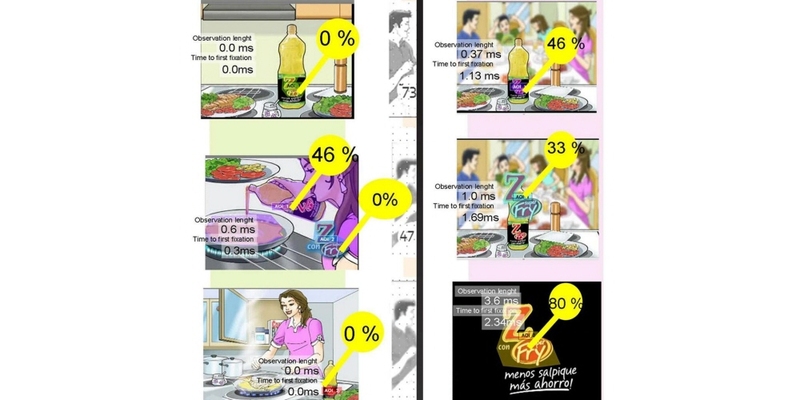 Brand recall was as high as 70% , leading Aceite Z "Super Fry" to score a total of 8 points in Top Of Mind awareness evaluations among 100 brands. The target group now perceives a benefit in Aceite Z's product, namely cost effectiveness and the ability to fry food without burning themselves on hot oil. The ZMET studies showed brand positioning focused on durability, cost effectiveness, power and care, in line with the brand's wish to convey safety along with its "Less Spatter, More Savings" value promise. A clear correlation was found in the comparative study between the animatic and final commercial. Respondents' attention levels were equal to that of the animatic, with the same gaze reactions during key scenes. 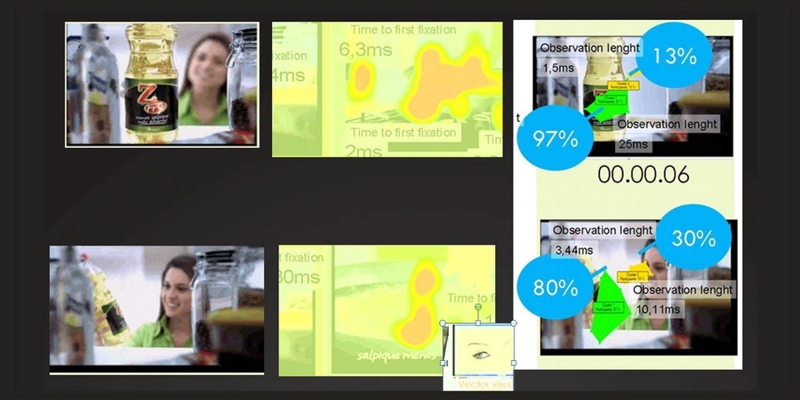 This enabled YanHaas to conclude that measuring animatics with eye tracking is a constructive tool to assess consumer reaction to the final promotion material. Team Foods' Aceite Zeta managed to recover its sales, both in value and volume, due to the commercial despite tough competition and a 40% price premium in the price-sensitive vegetable oil segment. Team Foods has adopted eye tracking as one of their standard tools, and will develop a pre-test post-test valuation system for future campaigns and continuous evaluation. YanHaas has a long withstanding relationship with Tobii Pro. Besides providing eye tracking technology that with great accuracy enables us to conduct quality studies, we also appreciate their innovative leadership.